General Dynamics is rolling in federal taxpayers' dollars and buying back its own stocks for billions of dollars. But it's asking Maine taxpayers for an extra $60 million. Click below to easily email your Maine state legislators and Governor LePage. Please edit the email to add your own comments. As your constituent, I urge you to reject LD 1781 and any tax breaks for General Dynamics. 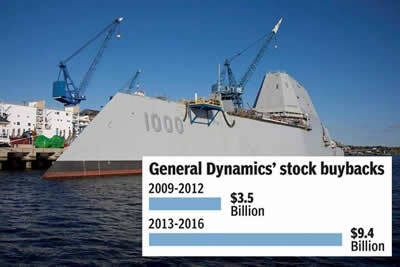 Already over many years General Dynamics has received more than $200 million in state and local tax breaks for Bath Iron Works (BIW). General Dynamics spent $14.4 billion buying back its own stocks between 2013-2017. The top CEO at General Dynamics in 2016 was paid $21 million. General Dynamics, like most weapons corporations, gets the vast majority of its operating funds from the federal treasury. The taxpayers are paying the freight from the start. Maine has 43,000 children living in poverty, thousands without health care, and major infrastructure needs. DOT is asking for $60 million to keep up with their transportation responsibilities. Maine can’t afford to give a corporate welfare check to General Dynamics.